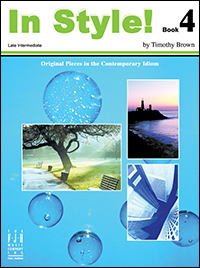 This is the first book in a new series that offers original compositions each centered around a specific theme. These compositions are guaranteed to capture the interest and imagination of developing students. 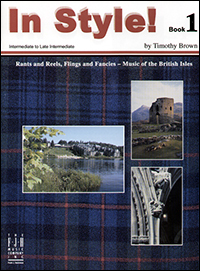 Celtic music was the inspiration behind this collection of original solo pieces for the intermediate level student. Commissioned by the Music Teachers League of Hattiesburg, Mississippi, in honor of their Composer Festival. In Style! 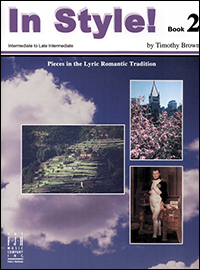 Book 2 celebrates the lyric romantic tradition through these outstanding original piano solos written for the intermediate to late intermediate level pianist. These artistic pieces capture the great tradition of Romanticism through music that is programmatic, portraying the musician as the expressive virtuoso. In Style! 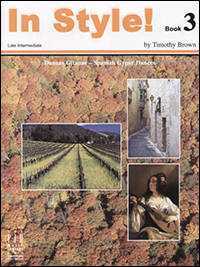 Book 3, Danzas Gitanas–Spanish Gypsy Dances for solo piano is a collection of original works by Timothy Brown that will inspire students to explore the rich tradition of Spanish keyboard music. This late intermediate collection is a sophisticated and artistic celebration of this style, and will serve as a valuable resource for recital performance music. The works included in In Style! Book 4 were inspired by 20th century composers including Prokofiev, Granados, Villa-Lobos, and Bartok, among others. Each piece is written to convey the unique characteristics of the composer who inspired the work.